RMS Titanic | Flickr - Photo Sharing! Description: A hand drawn black and white picture of the RMS Titanic, captioned 'S.S. Titanic'. Smoggy Mountain, dbrauer43, and 34 other people added this photo to their favorites. She was a very large ship in 1912, but would look small parked beside a 21st Centurhy cruise ship or oil tanker. I heard a story that might be true. They say that one of the four stacks was a dummy added for looks. I don't know which one, but I would thing the first or last one. Pictures sometimes show smoke from all four. I think the smoke coming from number one looks fake in this picture. My interest has been piqued. I think a visit to the Titanic website might be in order! I believe it was the fourth funnel that was the fake, not the first. It seems that the 4th funnel IS the fake one. Cheked it out in a number of sources. Howard33 Hi, one of the stacks was "so called" fake - it was the last - on the photo most right. However, the smoke isn´t fake - this stack served as a main exhaust of ventilation and stack from kitchen. Starej Grafik Thanks for the clarification on that. It's all fascinating and a buzz for us here on the other side of the world to where it all happened, even to have collection items about the Titanic. Too bad they really believed that God Himself could not sink this ship! I believe that along with peer pressure and thoughtlessness cost a lot of lives that day! May God bless them all and help them all to rest comfortably! Hi! 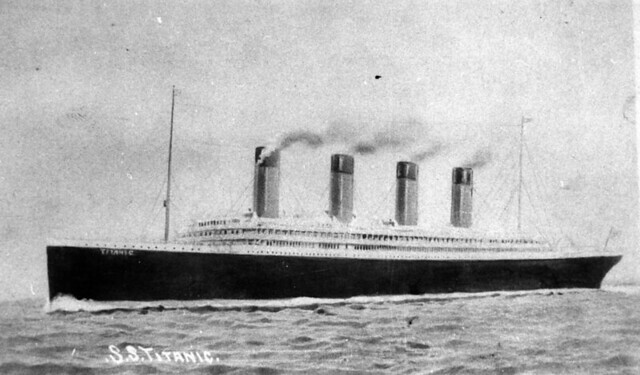 I am writing a historical novel about the Titanic The book is going to be published in Spanish. My question is could I please, use this photograph in my novel? Please, let me know your answer. Of course, you are going to be mentioned in the book together with this photograph. Looking forward to hearing from you. Thank you so much for your time! @the seeker without frontiers Hello there, you are welcome to use this picture for your novel, we love to see images in our collection out in the world! All we ask is that you attribute the image to State Library of Queensland. Thank you for enquiring with us about this matter and good luck with your research. Thank you so much! Yes, I will definitely acknowledge the State Library of Queensland for this photograph! Thank you so much again! Best regards to you!